Today is Veteran's Day. However, it wasn't always called Veteran's Day. Woodrow Wilson proclaimed Armistice Day as November 12, 1919 to honor those that had served in World War I. In 1953, a Kansas Shoe Store named Al King lobbied his city council and then his local House Representative to pass legislation proclaiming this day as Veteran's Day - to honor all Veterans. President Dwight Eisenhower signed it into law in 1954. This is a picture of Frank Buckles. He was born February 1, 1901 and will soon be celebrating his 108th birthday. He is the last surviving American Veteran of World War I. Buckles enlisted at age 16 and drove ambulances during the war. Afterward, he helped transport former German POWs back to Germany. He was in Japan in 1942 and was captured, serving as a POW until being rescued in 1945. 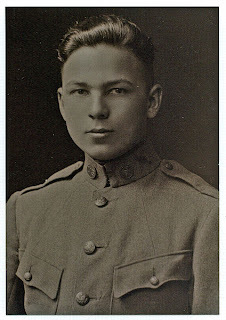 Buckles is accompanied by only 10 other WWI veterans worldwide. Frank Buckles is an American Hero. Today we honor those heroes, past and present, who put on the uniform of our country and defend the freedom that we hold so dear. To Frank Buckles, my father, my grandfathers, my uncles, my great-great grandfathers and all those friends and acquaintances that have sacrificed more than we can ever understand, thank you. It is my prayer that God will continue to bless this land with prosperity and liberty in large measure because of your service. Wow, neat story John! I didn't know anyone was still alive that fought in World War I! I have many World War II vets in my family, but the ones who fought before that have long since passed!